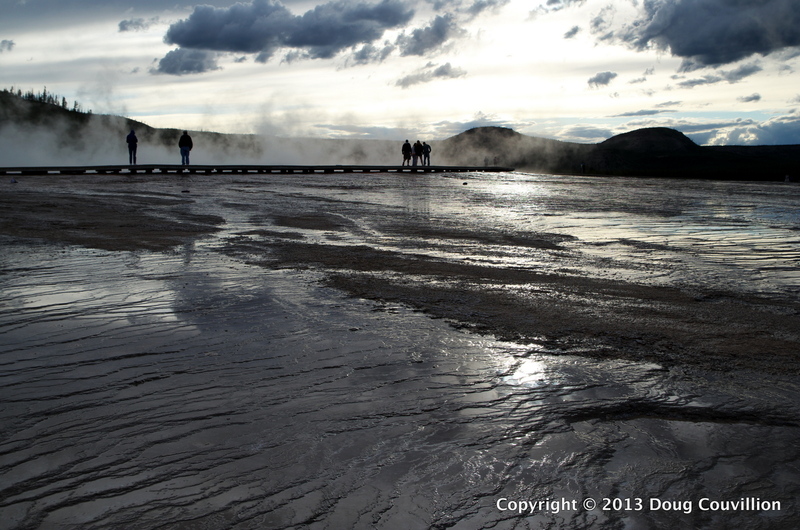 The sun hung low in the sky as I made my way toward the Grand Prismatic Spring, in Yellowstone National Park. I liked the strong contrast of the sun reflecting off the water and the silhouettes of the mountains and other park visitors. 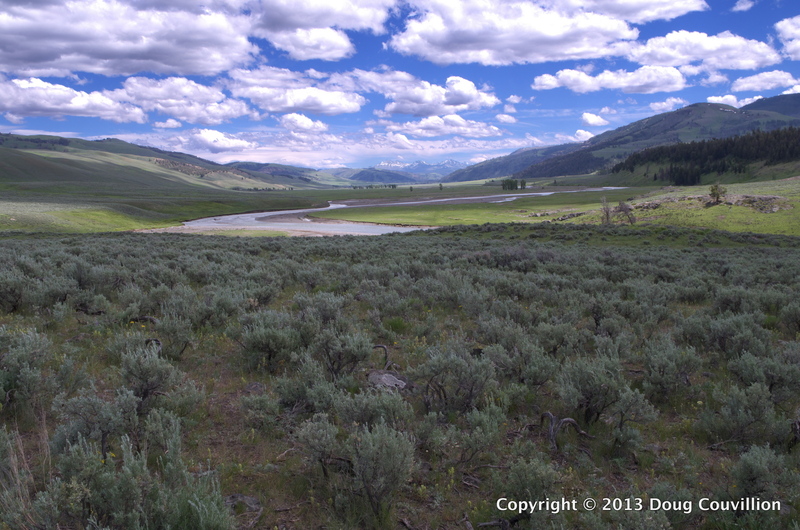 Puffy white clouds fill the sky over the Lamar Valley in Yellowstone National Park. 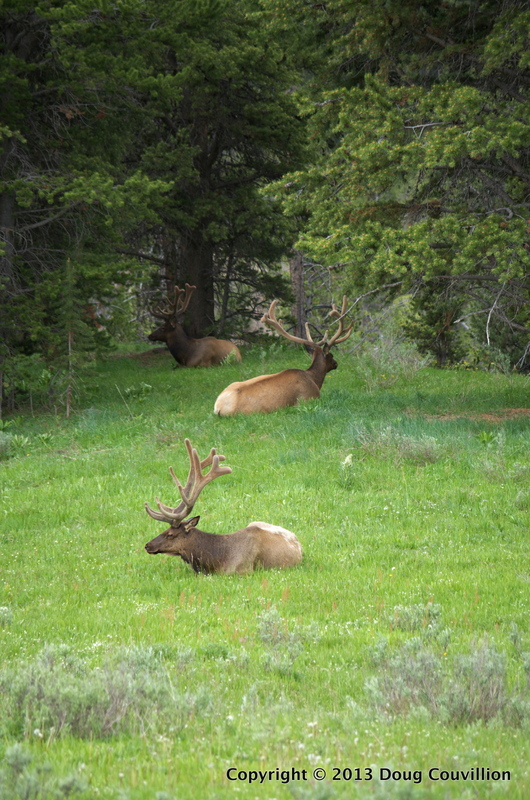 These three elk bulls relax at the edge of a meadow. With velvet still on their antlers they seem like three friends, just hang out together. Once mating season begins their will definitely be more rivalry between them. 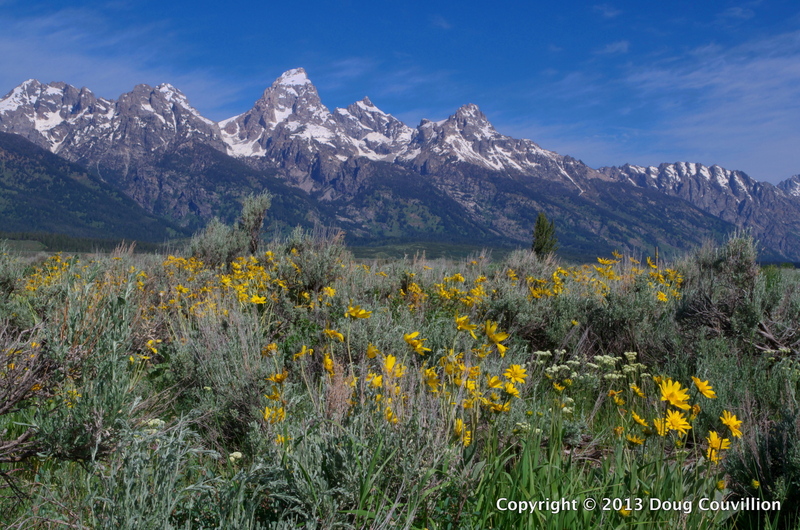 The views of the Grand Teton range are spectacular enough on their own. Throw in a few blooming flowers in the foreground and it’s hard to imagine a better landscape opportunity. 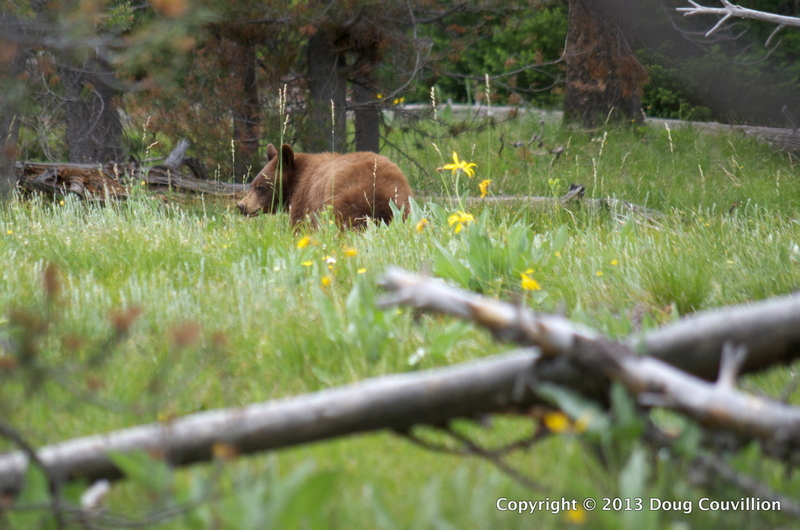 A black bear forages for food among the wildflowers and fallen logs in a woodland meadow of Grand Teton National Park. We were traveling north from the Old Faithful area in Yellowstone National Park when we encountered three bison traffic jams in the space of about 1 mile. The kids thought it was hilarious to watch them walking down the road, holding up traffic. 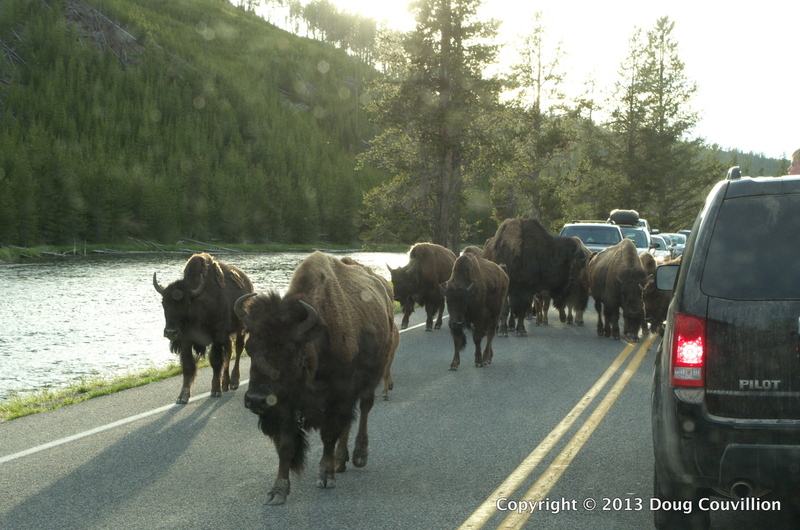 The bison took their time and would occasionally stop to look at a vehicle as if the cars were out of place. 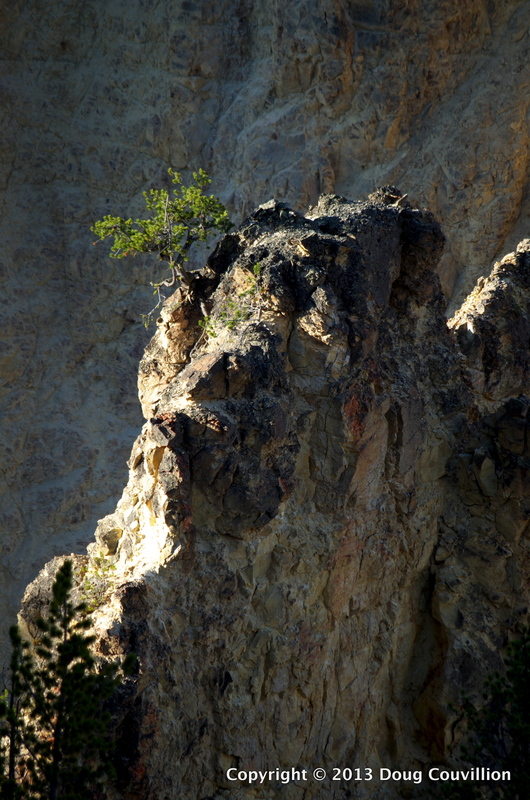 This lonely tree grows on a rock outcropping in the Grand Canyon of The Yellowstone. I photographed it one cloudy morning but the result was even, flat lighting, leaving the photo without much of a sense of perspective. The next day I was lucky enough to return at just the right time. The cliff face and tree were bathed in the warm, direct morning sunlight but the opposing canyon wall and the foreground elements were still in shadow. As a result, the subject is literally highlighted.